A select band of ladies from 16 to 77 (age, not handicap) gathered at hospitable Newmarket for a weekend of ferociously fought out tennis, the handicapping being such that matches often went over time to get the clinching game done, and four out of seven teams had total scores of 30 games won in six matches. As usual, we all had great fun, and I enjoyed seeing old friends in a new setting. 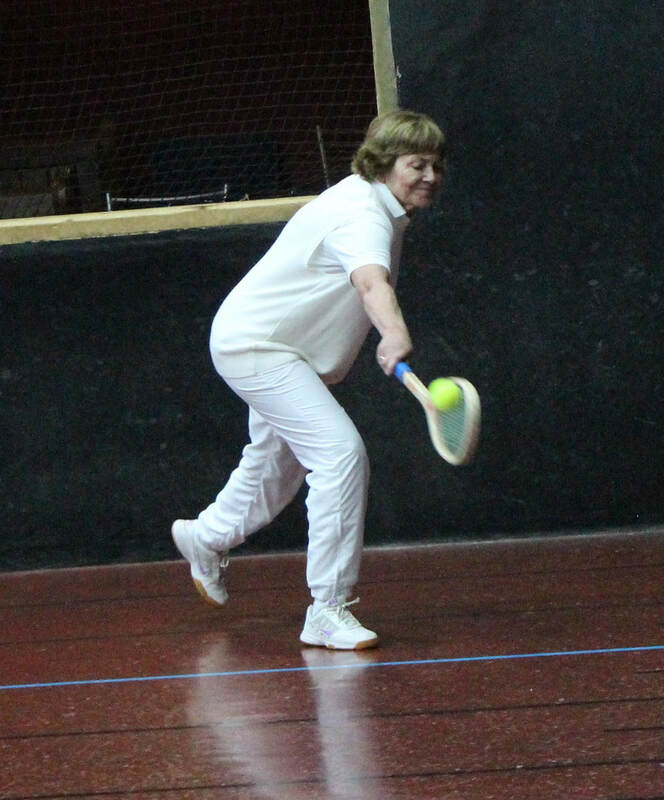 Some of the comments on the round robins were “brilliant”, “frustrating”, “tricky”, “well matched” and of course, “fun”….... And indeed, after a delicious dinner on Saturday night we all arrived on Sunday morning still keen for more tennis. After the round robins were completed, the best four teams lined up for the semis. 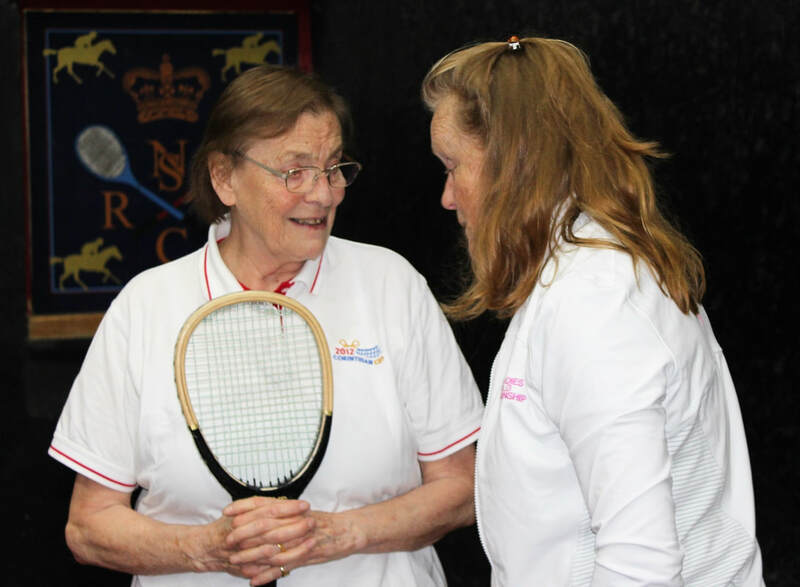 Unfortunately, Fiona and Sarah had to pull out due to injury and so Pam, now fully recovered from HER injury last year and Gael duly stepped in to confront Annabel and Katy in the first semi-final. At two games all and after fifteen chases, a pensive Amy noted “we’re going to be here for a while…” and indeed the 6/3 score did not reflect the closeness of the match. Annabel’s power combined with Katy’s strategic play to take the victory, despite Pam and Gael’s deployment of skillful serves and returns, eliciting Annabel’s plaintive cry “I’ve run out of court” as her racket met the wall. The second semi final, between the two Amys and the two Lucys, was memorable not only for fine tennis from all the players, but also for the classic “YOU” bawled by Lucy (standing by the main wall) to a scuttling Hannah, who crossed the entire width of the court to end up flattened against the main wall (and missed the shot of course). And indeed, that illustrated how it played out: Hannah retrieving returns and Lucy clinching wicked points down to the tambour, just tilting the balance in their favour against the gimlet returns from Amy Pye and the stylish serving by Amy Vigrass (what, another Vigrass??). 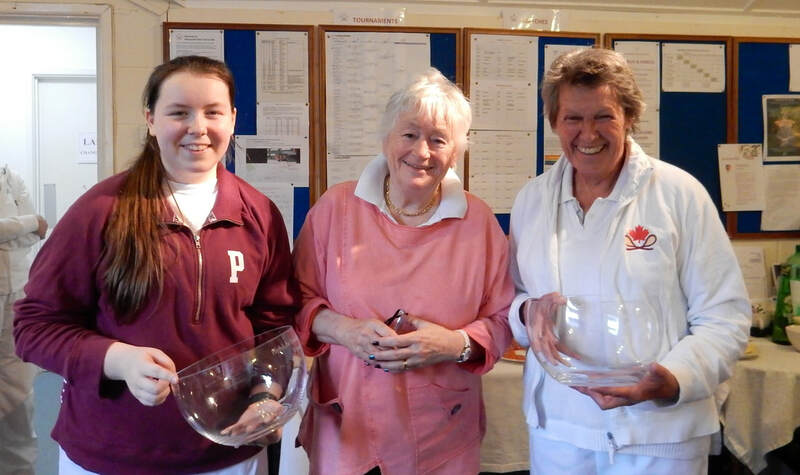 So title holder Hannah was back in the final, this time with a partner almost fifty years her senior, against Annabel and Katy. This time, strategy paid and the Lucys ruthlessly pummelled Katy on their way to victory. Well done Lucy and Hannah, and thank you to Pam for organising, to Hazel who looked after us and fed us so well, to Newmarket and its members for allowing us to use their precious court time and to Andrew who flawlessly marked the matches all weekend! Also many thanks to Inkerman for providing the beautiful trophies.